Hello, heatwave! 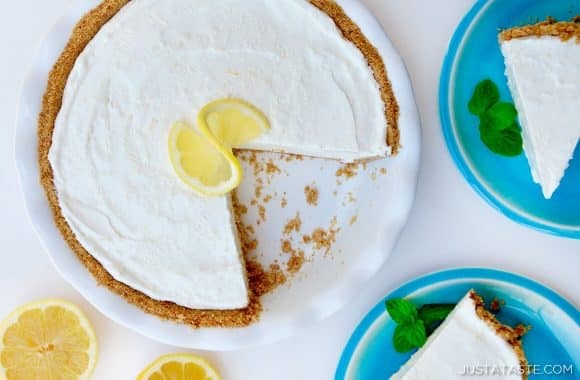 There’s no doubt that summer is in full swing in southern California, and the combination of high temps and being 8 1/2 months pregnant leads to only one rational conclusion: Frozen Lemonade Pie for every meal! A sliver at breakfast, a bite after lunch and a big ol’ wedge at dinner. This pie and I have gotten acquainted real quick this past week and I’m not complaining! 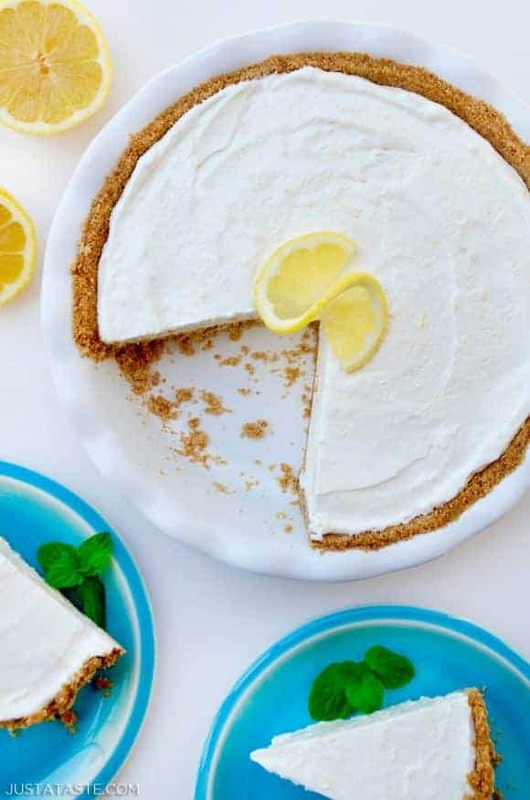 It’s the ultimate no-bake treat that marries a tangy fresh citrus flavor with a creamy consistency, and it’s all piled high inside a buttery graham cracker crust. No-bake pies are a favorite around here during summer months, and this frozen lemonade pie is giving it’s peanut butter and banana culinary counterpart some serious competition atop my list of frosty sweets. Best of all, this lemon concoction can be easily transformed into a lime- or orange-flavored dessert by subbing in your preferred citrus flavor into the recipe below. So what are you waiting for? Ditch the oven and beat the heat with the easiest, creamiest Frozen Lemonade Pie! 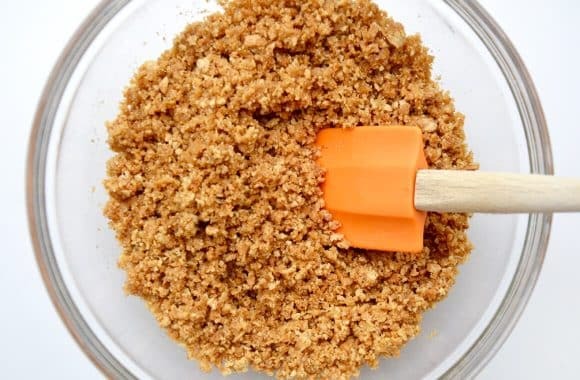 In a large bowl, stir together the graham cracker crumbs, melted butter and brown sugar until combined. Pour the mixture into a 9-inch pie plate or springform pan, packing it firmly into the bottom and sides of the pan. Cover the crust with plastic wrap and refrigerate it for 1 hour. In the bowl of a stand mixer fitted with the paddle attachment, beat the cream cheese and sweetened condensed milk until smooth. 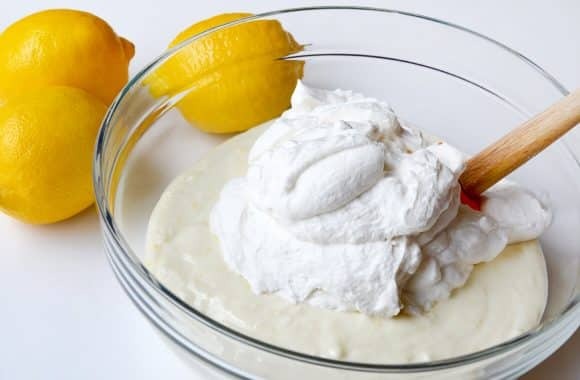 Beat in the lemonade concentrate, lemon juice and lemon zest until combined then fold in the prepared whipped cream. 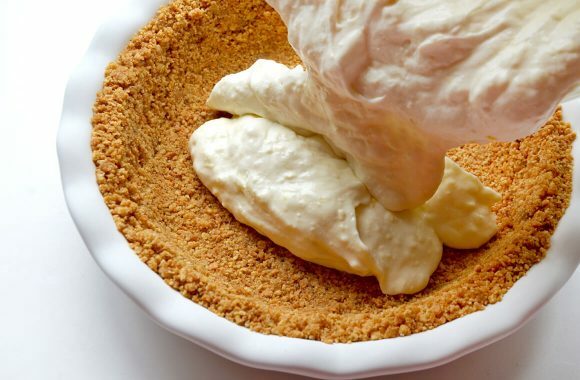 Pour the mixture into the pie crust, cover the pie with plastic wrap, and freeze it for a minimum of 6 hours or until it is firm. When ready to serve, remove the pie from the freezer and cut it into slices. In place of the homemade whipped cream, you can substitute one (8-oz.) carton frozen whipped topping that has been thawed.